France’s interior minister decries ‘poison’ of bigotry, notes 74% increase in anti-Semitic incidents in France in 2018 over previous year. The number of anti-Semitic incidents in France surged in 2018, jumping a whopping 74% compared to the number in 2017, a senior French official said Monday night. France’s interior minister, Christophe Castaner, lamented Monday that anti-Jewish acts were becoming increasingly commonplace. Castaner spoke out Monday night after it was discovered that a memorial site near Paris in honor of Ilan Halimi, a French Jew who was murdered in 2006, had been vandalized. A tree planted in Halimi’s honor was chopped down, and a second had been partially cut down, municipal workers said. “By attacking…Ilan Halimi’s memory, it’s the republic that’s being attacked,” said Castaner. Halimi was kidnapped by a French Muslim gang in January 2006. After his family was unable to pay the 450,000 Euro ransom, Halimi was burned and tortured to death and dumped naked in the street of a Paris suburb 24 days after his abduction. Twice this week, swastikas and other anti-Semitic graffiti were found at multiple locations in Paris, including the window of a bagel shop and mailboxes which featured the portrait of French politician and Holocaust survivor Simone Veil. 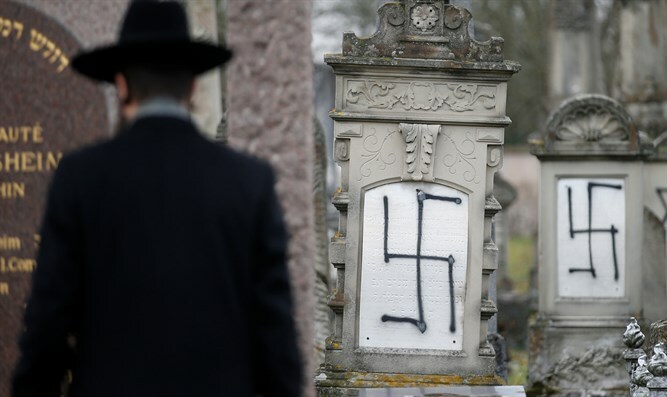 In December, grave markers in a Jewish cemetery near Strasbourg in eastern France were vandalized with swastikas and other neo-Nazi tags. Also that month, a 20-year-old Jewish woman was beaten and robbed by two teens hurling anti-Semitic epithets. Last March, 85-year-old Holocaust survivor Mireille Knoll was murdered and set on fire in her apartment in Paris. Knoll’s Muslim neighbor, Yacine Mihoub, and an accomplice, confessed to stabbing Knoll to death. Authorities described the murder as an anti-Semitic hate-crime. In April 2017, another elderly French Jewish woman, Sarah Halimi, was stabbed to death. Halimi’s killer, a 28-year-old Muslim neighbor named Kobili Traore, confessed to stabbing Knoll to death while shouting “Allahu Akbar”. While police initially declined to label the murder a hate-crime, a French court later classified it as such.